This is an annual event that held by Pelatuk BSC UNNES since 2014. Pelatuk has been participated in WMBD and have many event that has been done. In this year of 2018, we will have a festival that spread love to the nature especially about Bird conservation. We will campaigning about conservation to the people, and persude them to take action in Bird conservation. A festival about bird conservation that will be held in two different location. 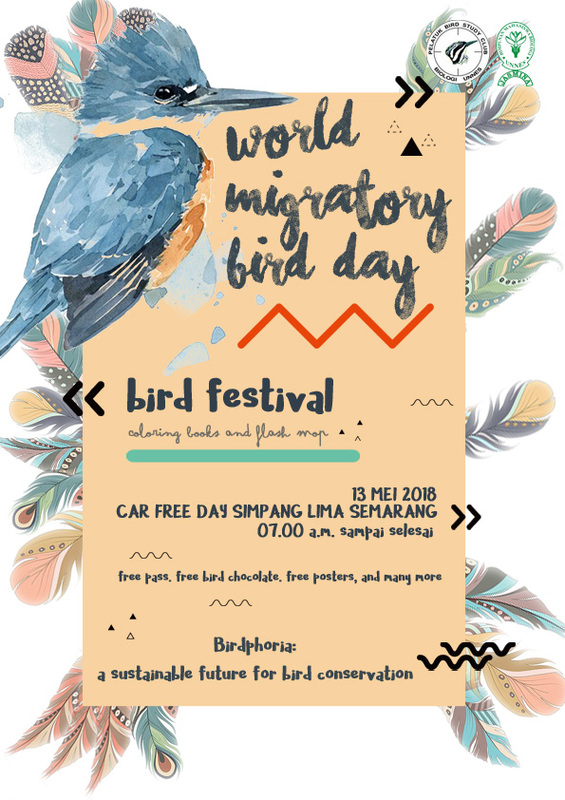 The first location is in Car Free Day Semarang, this event will introducing the bird migratory to the childerns and people who attend the CFD. We will give a drawing about migratory bird and the child will coloring that drawing, in hope that the childs will know about bird, especially migratory bird so they can be aware since early stage. We also held a flashmob and have a mascot in bird costume. The second location is in Campus of UNNES (Universitas Negeri Semarang) around D1 building, and have a stand to spread about bird migratory, in this event we will persuade college student that participate to take a photo to campaigning the WMBD and give them sticker and pin about WMBD. We held the event in hope that people will be aware of Bird conservation, and take action to them.